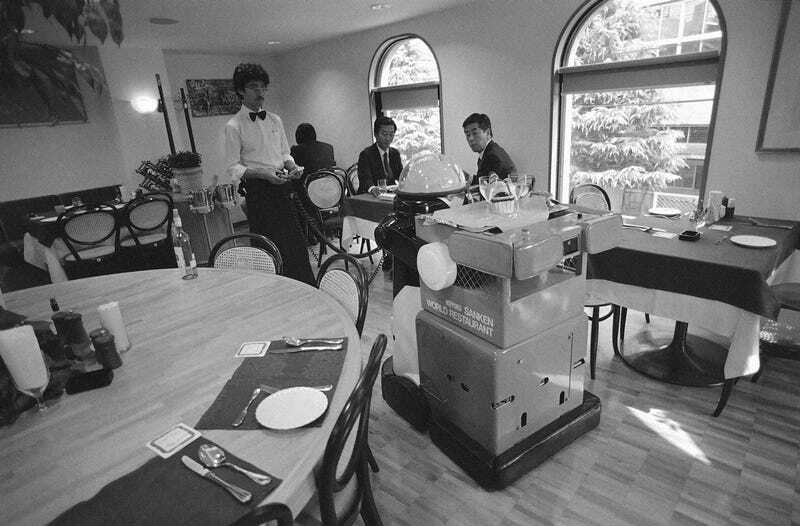 While the robot waiters of mid-’80s Pasadena were serving up chow mein at the Two Panda Deli in sunny California, another robot waiter 5,400 miles west was slinging spaghetti at Grazie’s Italian Restaurant in Tokyo. Released in 1985 by the Japanese company Daimichi Koki with software designed by the Seibu Saison Group, Ken-chan was a 4-foot-tall robot waiter that buzzed around Grazie’s, helping most often with the wine selection. Ken-chan was supposedly guided by a radar senor that was intended to detect other objects around it and maneuver within the tight confines of a restaurant. However, the robo-waiter was far from autonomous: It needed to be led around the restaurant by humans who used a remote control with a 12-foot cord. Ken-chan couldn’t take orders or even set food on a table, but it did attract a crowd. Off the shelf, the metal server could utter just 15 different phrases in Japanese including “My name is Ken” and “How about dessert?”—but you could add the “Happy Birthday” song to its repertoire for an additional $425. Anybody who’s in the mood for Italian food served with a unique flare should try a new restaurant called Grazie in Tokyo’s Ropongi district. “Some people come in and order just a cup of coffee or tea to see the robot,” said Kenichi Echiuya, manager of Grazie’s and three other restaurants at the same location. Scientists are predicting that labor-saving robots will revolutionize the industry in the 21st century and free millions from the drudgery of menial service jobs. The Pacific Stars and Stripes piece ends with a particularly depressing visual — the robot waiter relegated to the corner of the restaurant, waiting for a future that may not be quite as spectacular as we were promised. Ken-chan now gathers dust in one corner of the restaurant, waiting for technology to catch up with the complexities of waiting tables. His inactivity is seemingly mute evidence that the 21st century and the golden age of robots might be a lot more than 13 years away.